School Leaders are not Data Technicians and children are not units of data. This mechanistic approach can be damaging to Head Teachers, because there are negative inferences behind the questions that are frequently asked of them. Being held to account and responding to questions is no bad thing. As a public servant, it is only right that you are held responsible for your actions. However, the climate surrounding school improvement over the past decade has led to increased ambiguity and inconsistency. This has led to heightened levels of fear and mistrust within the profession. This has created an unhealthy dynamic between politicians, policymakers and schools. It has also impacted negatively on the type of relationships that exist between School Leaders and those who the government entrusts with the power to hold schools to account i.e. school inspectors and advisors. Against this backdrop of fear and mistrust, when questions are asked, it very often leads to a lack of incentive and can be more of a hindrance to school improvement. Observe any child in any classroom where the family dynamic has installed these beliefs in them and you will see how they struggle to fully engage with the learning process. It is the same dynamic that now exists for many of our School Leaders. It is damaging for them and it is damaging for our schools. When you can see this relationship model at work in our schools, you will appreciate that when head teachers are asked the following questions it can prove damaging for them as leaders and in turn, their school. – How quickly can you get your results up/turn your school around? – Why hasn’t the school improved yet? – Why have we not seen improvements in these areas? This line of questioning sends school leaders into a permanent state of high alert, a “survival mode” whereby they feel constantly on-edge and fighting to stay in their role. In this state, stress-levels are high and whilst stress in small doses at occasional moments can motivate, subjected to this state on a daily basis will inevitably lead to burn-out or worse. Heads also find their behaviours and relationships with others at school begin to change. To protect themselves from judgement, they place an invisible shield around themselves. To avoid being wounded, they don’t allow their true self (their feelings, concerns and fears) to be seen by others in case it used or held against them. This stops Heads seeking the help they often really need as they fear what the judgement that may come there way, if they do so. They fear that getting support will be seen as weakness and so rather than feeling able to reach out, instead they recede into themselves and are forced to endure an even more isolating experience of the role. Because Heads immediately know that when questions allude to pace and speed of change, they are in effect being told to throw out everything they know about embedding change and good practice. They know they are being told to adopt quick–fix solutions for short-term gain. Without any questions that connect Head Teachers to their original vision, passion and purpose, many of them are left to feel as though they are simply a cog in someone else’s machine. When you feel this way your whole raison d’etre is challenged. As a result, school leaders become disheartened and eventually begin to disappear’ from schools and the profession. If the Powers-That-Be believe that this approach works, then they need to think again. Inducing fear and risk-averse behaviour only works against the creation of environments in which both adults and children flourish. – What would facilitate your growth in this role? – What activities would support you in sustaining yourself and your passion as a leader? – When are you at your best and how can you make changes to ensure that you are this way more often? An inner re-alignment begins to take place. When they are encouraged to participate in a cogent dialogue with the deepest questions of their soul, a re-awakening of what it means to be human occurs. Individuals discover what it’s like to step out from behind their masks. They discover what it means to embrace their vulnerabilities and stay closely connected with their original passion and purpose. The questions that individuals are invited to explore are not the archetypal school improvement questions that most school leaders are used to answering. 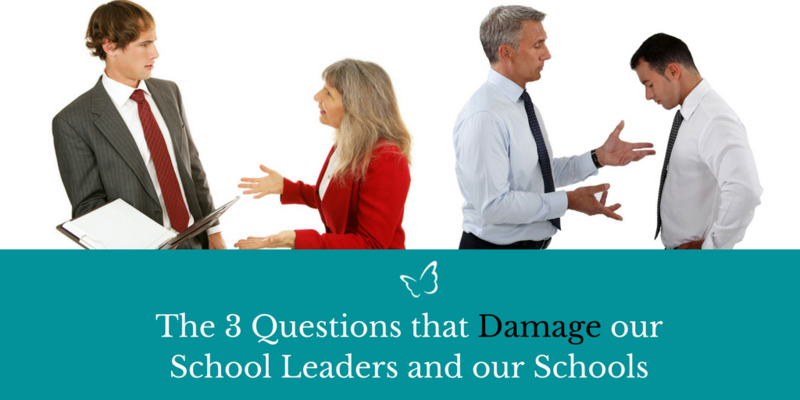 Instead they are the type of questions that challenge school leaders to bring out the best in themselves. Persist in asking me questions that seek justification for external outcomes and I become a stranger to my inner world, upon which these external outcomes depend. I will seek to defend, ‘who I am’ and what I bring to my role. On the other hand, ask me questions that invite me to explore the ‘how and why’ of what I do and then you invite the best in me to come forth. You invite my soul to come out from behind its defences and engage in a dialogue that awakens the passion and drive that is integral to pushing us forward and sustaining us in our role. School improvement is more than just the presentation of data and a well written school development plan. It is a humanitarian endeavour that must ignite both passion and intellect. I just hope the system begins to realise this and then reflect this. We all need chance to explore the questions that are of real importance to us as a person and in our roles. That’s why we’re offering School Leaders a chance to retreat, re-energise, reconnect with your values and explore what matters most at our summer School Leader retreats. Places are very limited, so to avoid missing out – please register your interest today!